That was all done by Confederate Loyalists after the end of the Civil War and has all been dug up. There wasn’t actually any “treasure” in the graveyard. The graveyard was the the starting point for locating several caches in the area. Around THAT area and Marthaville, LA area there was a wealthy man who recently passed who owned lots of land up there a sawmill and trucking company and cleared land, he for as long as locals knew had always been wealthy but his wife once told my ex his grandson stories about when she had her first child in a house with dirt floor so within their first five years of marriage he obtained tons of wealth…NOTE he has caves on one of his properties he would not let his own sons and grandsons go around and turned down anyone who came looking to find them..I just thought for the researching treasure hunter it may be worth looking into I am sure his living sons and 1 daughter now control his properties and they don’t strike me as the type to look for anything on thought they may be called foolish the man’s name is William Powell…..and maybe he found ot and knew there was more…everything he owned trucks equipment were always paid for in full in cash and my ex said he kept the big popcorn cans stack all around his place to the ceiling containing 100 dollars all in old bills…I did see my ex with many of the bills when he worked for them they would sometimes give them to him I myself was never allowed to go there with him even though we were together for 11 years and I too come from a working class but wealthy family from Calcasieu Parish but bc his grandpa did not know my people was the reason they asked that my ex not bring me there bc my family werent from there my family owned the dodge place there and now the ford and he still didf not allow me nor any other person on therir property he and his wife actually lived at…they said he would not even let ups come there to deliver….Maybe it was bc he knew there was something there??? I’m delving deep into the tale of Lafitte treasure in Avoyelles. Meeting a lot of dead ends and private property. 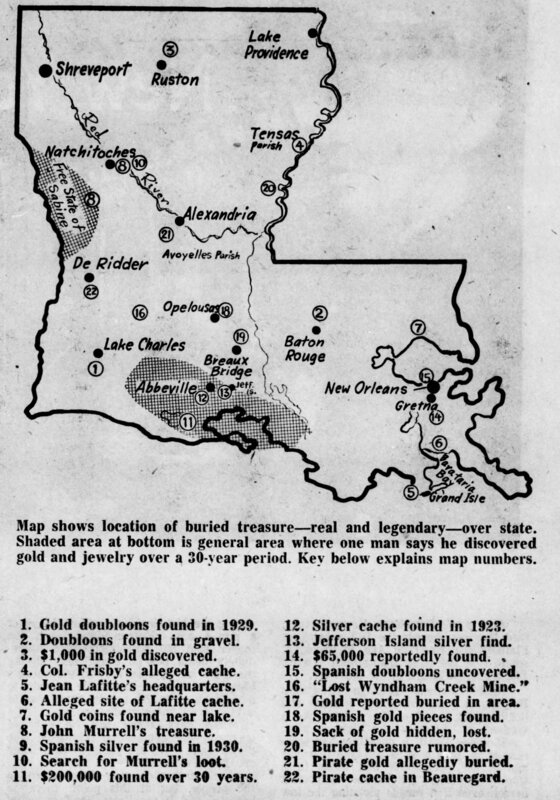 Anyone else know information on Lafitte family treasure buried along the banks of Old River on old Glasscock property? 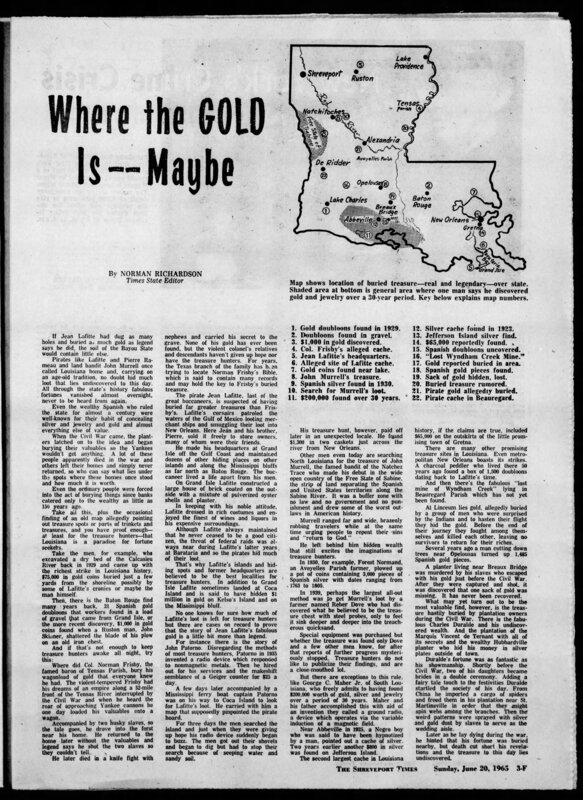 As a young boy growing up in Avoyelles Parish(Hessmer) I heard several times about the said gold/silver being plowed up by a farmer here. I say here because the elderly men from whom told me the story of the gold/silver were from Hessmer. This through me off track as I have been doing research about the silver find for the passed 50 years or so off and on. My first lead pointed to a rather wealthy man here in Hessmer as the finder, but through further research and speaking to one of his sons, I realized it was not him. From the dates on the coins 1763 to 1805, I asked myself who at that particular time would be in access of so much money. At that time Louisiana was under the control of the Spanish. They established a post here in Avoyelles in 1780 with several Spanish Commandants. There was Jacques Gaignard, Noel Soileau, Estevan Roberto de La Morandier and Domingo de Apert. My first thought was that one of these commandants stole the Spanish Treasury before turning Louisiana over to the Americians in 1805 as Louisiana was purchased from France in 1803 as we all know, but the Americans did not take control of the Avoyelles Post which is now Marksville,La. until 1805. Through further research I came to the conclusion that the Spanish commandants did not go off with the loot. Their dates of death, dates of service at the Post did not add up to either of them. Looking at old land plat maps I have of 1939 and 1879 and other maps I found on the Net I found the area of land ownership of Forest L. Normand at the time of his aledged silver find. Looking at the old 1879 map overlayed,I found that the first owner of that property was Daniel Gaspard. Daniel came to Avoyelles Parish about 1776, earliest records mention his name in 1794. Daniel was born in 1750 or about and died “here this” in 1807. Remember the last coin date of 1805. Spanish coins called (reales) were minted in Mexico and Spain at that time. Now it would have taken quiet a few months or even a year or so to put these coins into circulation. Just the other day I happen to find for the first time a 2017 coin in my pocket change, now that’s 6-7 months after it was minted before it got into circulation. Imagine how long it would have taken an 1805 minted coin even from Mexico much less Spain to reach Avoyelles Parish. It is my belief that Daniel Gaspard buried that silver and then died unexpectedly died before he could reveal to anyone where he had buried his Cache. Then there is the possibility that someone else buried it on his property, but I believe that unlikely. I’d bet Daniel put it there. According to records he was a wealthy land owner of several hundred acres. It took 125 years before lucky Forest hit the Jack Pot now this happened during the Great Depression remember? I do not condone any digging on property that does not belong to you without getting permission. Ok I’ll try and give you some information. However, some of his money made it to East Texas. I want (No money ) , None. I ask for nothing. I’m searching for my own trail. ( Family money.) But I may have some information on what you are looking for. Contact me at my E-mailed. With (Gold) in the subject line. I will confer with you there.